During the Bloc Party (convention) in Montreal this weekend, leader of the Bloc Quebecois Gilles Duceppe openly mused about the possibility of subverting the Canadian military in the province Quebec to become an army of the independent nation of Quebec. After intense discussions on whether such a force was viable or necessary, the some 1,000 delegates rejected the idea using the more politically palatable term “national guard” instead of army. They also agreed it could be created by taking over Canadian military facilities. Duceppe said he had faith a Quebec army would have no trouble recruiting. R.S., c. C-34, s. 53. Gilles Duceppe is walking a fine line here. 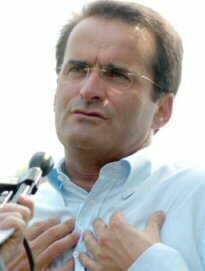 Transport Minister Jean Lapierre demanded an apology yesterday from a Bloc Quebecois leader who said members of the federal Liberal party would be unwelcome in an independent Quebec. Lapierre, Prime Minister Paul Martin’s Quebec lieutenant, told The Canadian Press in a telephone interview he was “personally hurt” by Bloc house leader Michel Gauthier’s comments. Gauthier refused to apologize. Because Lapierre is a founding father of that same separatist party perhaps we can understand how this hits close to home. However, I imagine that many federal Liberals aren’t much welcome in the rest of Canada (except for perhaps Toronto). 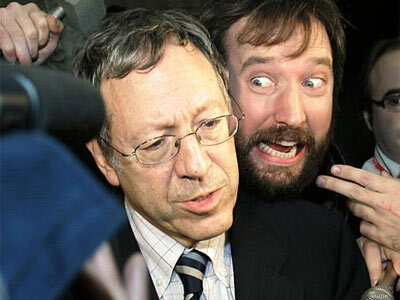 Caption this photo of Tom Green sneaking into the scrum surrounding Justice Minister Irwin Cotler. Separatist to receive separate prize money than that awarded by the Queen’s Canadian vice-regal and disavowed crypto-separatist. Money to be raised by separatist Member of Canada’s federal Parliament. Just so we’re clear, this has little to do with the concept of our country, yet it is so typical of it. Is this a stupid or exaggerated statement? However, the people of Kashechewan have been suffering under these conditions for eight years and have been ordered to boil their water for the next two. Further, about 100 other native reserves are also under ‘boil water’ advisories. Do I honestly believe that Paul Martin doesn’t care about Native people? However, I do believe that Kashechewan has been mismanaged by the federal Liberal government. This is our national shame. Like most Canadians, I only learned about the situation in Northern Ontario this month but how is it that only when the situation gets national media attention does the government come up with an action plan? This has been going on for eight years. Shamefully, the media is treating Paul Martin’s government with kid gloves in contrast to how they personally attacked Mike Harris during the Walkerton incident. Are the Liberals getting a pass on this one? Perhaps Canadians (including the media) are conditioned to believe that these squalid conditions on reserves are the norm and thus not at all too shocking. While Paul Martin likely cares, he may be largely indifferent and perhaps we as Canadians also share this unfortunate state of mind. How is it that we have people in this country living under sustained third world conditions? How is it that we’ve never devised a working solution to this problem? Will this crisis spark an honest national debate on the issue of Native poverty? There are potential solutions to the problem, from caring people both on the left and on the right. I must say that I am without much knowledge of native and northern affairs and this tragedy has inspired me to read up on the subject. Perhaps Andy Scott should do the same. We all care about the situation in Kashechewan, but coming up with a lasting solution for these poor people and not merely a quick fix is what I care about most. My pal Brad Farquhar has a monumental task on his hands. He’s fighting the good fight against the Liberals and while his home province of Saskatchewan is virtually free of them, there remains one and it’s not exactly a backbencher: it’s Minister of Finance and Challenger frequent flyer, Ralph Goodale. Since Brad’s taking on the finance minister, he’s been up on his research pointing out exactly why Liberal finance policy is hurting Canadians. Teaming up with Monte Solberg and Dean Allison, Brad is taking the Liberals to task for their assault on Income Trusts. Brad outlines the studies, the background and the media coverage necessary to get anyone up to speed on the issue. Brad also provides some help to contact the 302 sitting MPs to urge them to act upon the issue. Let’s hope Brad takes this issue all the way to Ottawa himself. Deputy Conservative leader, Peter MacKay rose in the House today to speak of the contradictory positions given by PM Paul Martin and his Deputy PM Anne McLellan. This contradiction was outlined in a post that I wrote yesterday. Tell your friends! Email them this post! “The Americans ask us to do things in terms of the border; I think there’s an obligation on their side to work with us to prevent gun-smuggling into Canada.” — Paul Martin, October 25th, 2005. Federal respect for provincial jurisdiction. delivery organizations closest to those they serve. of greater responsibility for choices and personal well-being. Now choice is a beautiful thing of course and the document reads in a very practical sense. Manning and Harris recognize the current balance in the state/individual dynamic that currently exists and they prudently nudge their ideal towards that which favours individual choice in the delivery of social services that fall within the provincial realm of jurisdiction (education, healthcare, welfare). Particularly Harris and Manning note the success of the provinicial administration of education that thrives without much federal interference. As such, the two men argue that this lack of federal manipulation allows greater flexibility within the system and permits greater agility to meet its own needs. Essentially, the document argues for the severance of the strings attached to the provinces as manipulated by Ottawa. Caring for Canadians offers a formalization of the healthcare approach which is currently a reality in our country. While advocating for a universal system accessible to all regardless of one’s ability to pay, Manning and Harris propose a mixed system of private and public delivery of healthcare delivery, payment and private insurance. The Conservative Party of Canada will be happy to hear many of their positions reflected within this new Fraser Institute publication, especially on the topic of childcare. Not surprisingly, Manning and Harris decry the new creeping federal attention to this matter of provincial jurisdiction. NDP: The fix is in! I got an email at about 7pm last night from a reader encouraging me to post about an NDP youth poll that I could help swamp by getting the word out especially on the Shotgun blog and through some other conservative blogging friends. After writing a post on the Shotgun, encouraging its conservative audience to participate in the poll and after successfully suggesting to Kate that she should also encourage her readers to do the same, the numbers went wild for Stephen Harper. Free Dominion also contributed heavily to skewing the numbers in the Conservative leader’s favour. In your opinion which federal leader has done the best job of standing up for students? It has three options: Paul Martin, Stephen Harper and Jack Layton. Well, I thought, we’d successfully bombarded the NDP poll with the power of the conservative blogosphere and internet. So, when I got a call from some friends to head out for a pint, I decided that the ball was rolling and the damage for the most part had already been done. However, when I got back from some late night wings and drinks, the following graced my screen. Somebody woke up the NDP webmaster! Those logs must have been crazy too. The poll went live yesterday morning and registered little activity throughout most of the workday until we coordinated our attack just after the dinner hour. During that time, Freedominion, the Shotgun and the busiest blog in Canada (Small Dead Animals) were all referring conservative-minded people to vote. I was laughing by the time I logged off when we had captured 78% of the 545 vote total of the day. However, between the hours of 12:09am and 2:40am, 8 people voted for Paul Martin, 108 people voted for Stephen Harper and Jack Layton’s vote went up by 912! The vote total had tripled during these short early hours. How could this be? In fact, FD poster Vek noticed the same at 1:49am. So, either the NDP blogging power kicked in at 9x that of the conservative blogosphere at about 1:30am, or the numbers were manipulated. Vek’s observation shortens the NDP supposed “surge” (or likely manipulation) to a window of 1h 40min. This isn’t very honest. I laughed when I imagined the NDP webmaster’s discovery of the poll results but I expected him/her to remove the poll entirely. However, the numbers were most likely manipulated to give Jack Layton a 900 vote boost sometime during the wee hours of the morning (12am-2:30am). A period in which the highest traffic blog in Canada (and the Shotgun, and Conservativelife and Freedominion) only contributed at most 108 votes to Stephen Harper. Also, isn’t the idea of such a poll on a partisan website a silly idea? An NDP poll on an NDP site asking visitors to choose the most effective federal leader is hardly scientific. Their audience bias is obvious. 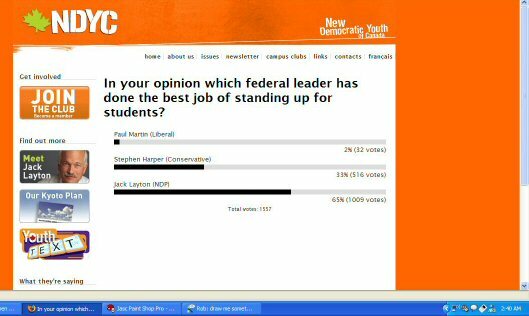 Nobody would take any stock in Jack Layton winning the poll. Perhaps that’s why it was so funny that we hammered the poll and had Stephen Harper winning (by legitimate votes). I guess I can’t be too hard on them though. We did the same thing to them on their silly insignificant web poll that they did to Terry Fox during the Greatest Canadian contest. However, when the CBC didn’t like the result, they didn’t suddenly dump a truckload of votes on Pierre Trudeau. UPDATE: 12 hours after I last took a screenshot, votes are still coming in for Stephen Harper. 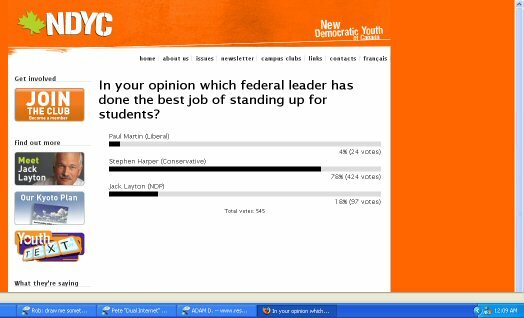 In fact, Harper is up by 280 votes, Jack Layton is up by 70 votes and Paul Martin is up by 8 votes. Two observations: (a) Layton’s 70 votes seems to be consistant with their actual rate of legitimate voting over twelve hours. During yesterday’s vote, Layton had 97 votes by midnight. (b) Harper’s votes are still streaming in from various Conservative websites even though it has been revealed that voting for Harper in this poll may never allow him to win. as of 2:40pm EST, October 21st. Posted on October 21, 2005 Author Stephen TaylorCategories OtherLeave a comment on NDP: The fix is in!